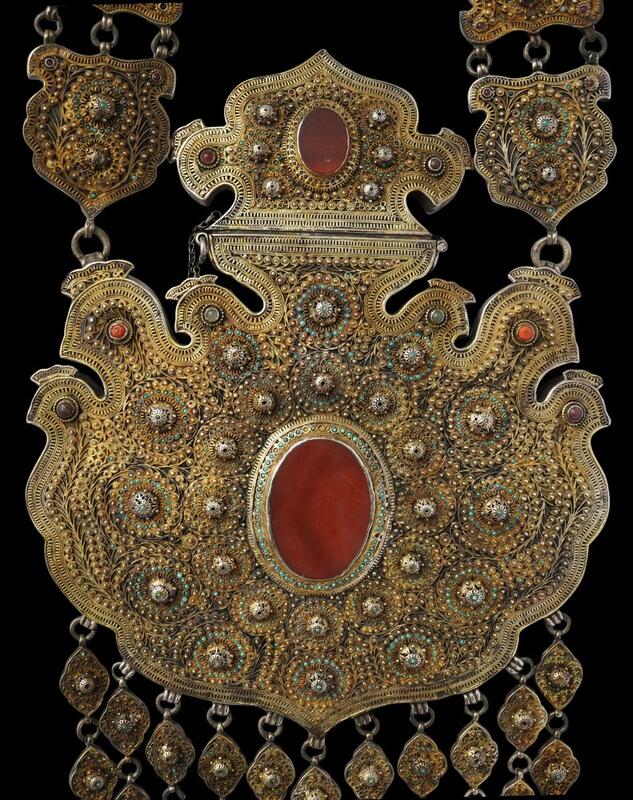 This massive hollow ornament of gold-covered, high-grade silver embellished with semi-precious stones was made to hold Koranic verses and other items with amulet-like properties. 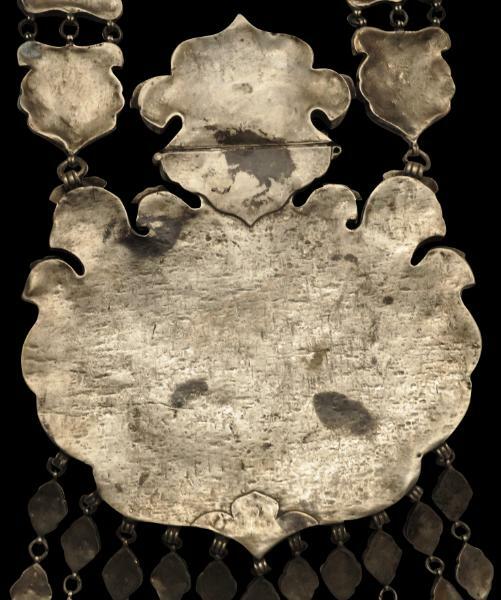 Possibly it was worn around the neck of a horse most probably on the occasion of a wedding procession, but otherwise would have hung on a wall inside an aristocratic house as a protective device. The crest-like top of the amulet box is hinged on one side and lifts up to allow access to the interior. It is kept closed by means of a silver pin attached to a silver chain. The box itself is in the form of two larger and two smaller stylised crested birds and is decorated with copious filigree work, applied bosses and numerous turquoise, coral and red stone cabochons (some stones are deficient) around a central slice of agate in a box setting. A similar piece of agate is mounted in the crested cover. The box is suspended from two chains of four gilt pendant cartouches each, and these are suspended from three thick chains of finely twisted silver wire. Eleven chains of suspended pendants hang from the ornament. These also are of silver gilt, with numerous filigree bosses and filigree floral applique, and turquoise cabochons. The Emirate of Bukhara was a Central Asian state that existed between 1785 and 1920. It occupied a region formerly known as Transoxiana. The ancient trading outposts of Samarkand and the emirate’s capital, Bukhara, were the principal cities and it bordered the Khanates of Khiva and Kokand. It is now within the boundaries of Uzbekistan. The Emirate was founded in 1785 by the the Manghit emir, Shah Murad. The Emirate lost a war with Imperial Russia in 1868 and Russia annexed most of the Emirate’s territory. The Emirate became a Russian protectorate in 1873. The position of the Emir remained of which Abd al-Ahad (Emir 1885-1910) was particularly notable. (This amulet most probably dates from his rule.) The conservative Emir Mohammed Alim Khan was removed in 1920 when the Emirate was over-run by the Red Army and the Bukharan People’s Soviet Republic was established. Several similar amulets were included in Christie’s New York, ‘Indian and Southeast Asian Art’, March 31, 2005, lots 213-217. Overall, this is a rare, visually stunning, extraordinary item from the Islamic world. It is in excellent condition, contains a great deal of high-grade silver and is ideal for display mounted against a wall. Mansel, P., Sultans in Splendour: Monarchs of the Middle East 1869-1945, Parkway Publishing, 1988. Tareq Rajab Museum, Kuwait, 1994. Christie’s New York, ‘Indian and Southeast Asian Art’, March 31, 2005, lots 213-217.
to see a related Bukharan amulet. 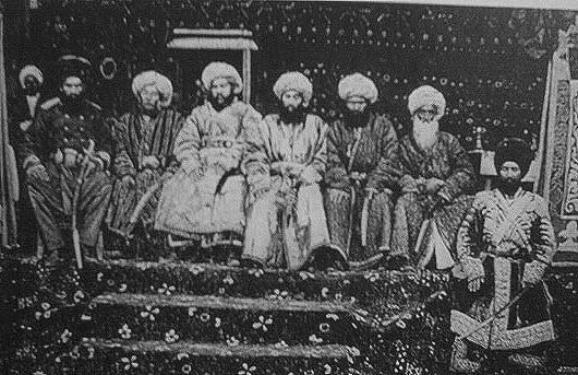 The Emir of Bukhara and Ministers, circa 1905. 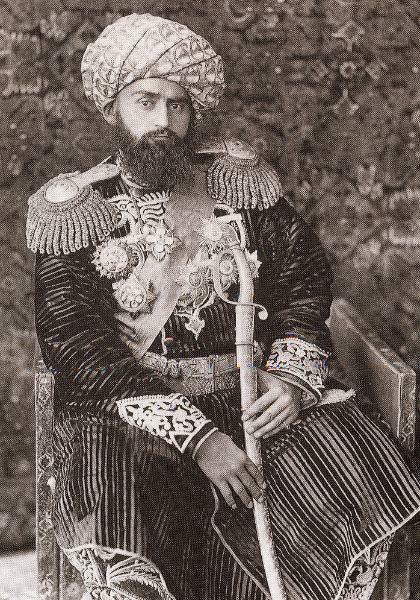 Abd al-Ahad, Emir of Bukhara (1885-1910).